A key concern for seniors is the gradual decrease in muscle mass that occurs as we age. Less muscle mass can lead to falls, a decrease in mobility, and a general feebleness that can be quite frustrating. So it’s vital that the elderly take steps to maintain muscle as they age. One good way to do this is with exercise. But as always, diet is the other side of the coin. You probably know that to build muscle, you need to eat protein. That’s true for seniors too. But new research is indicating that for this population, not only does it matter how much protein is consumed, but it also matters when it’s consumed. Scientists at the Research Institute of the McGill University Health Centre have been following a cohort of people age 67 and older living in Quebec. For a study published in the American Journal of Clinical Nutrition, they investigated the diets of these seniors. This cohort included 827 healthy men and 914 healthy women. The researchers wanted to determine links between diet and strength, muscle mass, and mobility. The researchers were surprised to find that while protein did indeed increase muscle mass, it did so more effectively when the seniors spread out their intake throughout the day. Specifically, when they added a protein source to breakfast rather that only eating protein-heavy meals for lunch and dinner, they fared much better and had an increase in muscle strength. 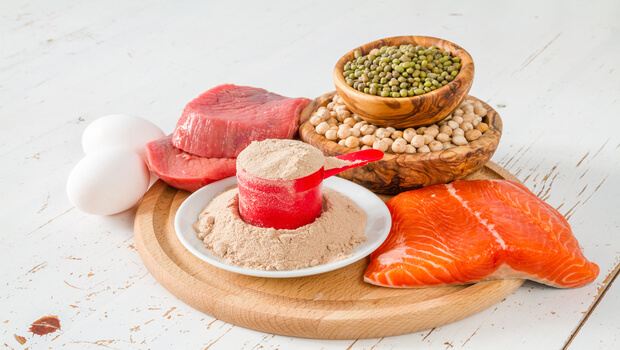 The researchers found that one of the best amino acids for protein renewal is leucine. So if you’re concerned about losing muscle mass, upping your leucine intake is an important element of reversing the trend. Fortunately, there’s an easy way that you can do just that. And you can do it at breakfast (or any meal you like, if you’re already an eggs and bacon kind of person). Try Advanced Protein Powder. It contains 2,062 mg of leucine per serving, along with seven other essential amino acids and a variety of other non-essential amino acids, giving you 15 g of protein per serving. It doesn’t contain added sugar or artificial sweeteners. But it does contain plenty of healthy fats and additional vitamins and nutrients. It’s easy to add a scoop to a smoothie or milk to get your day off to a protein-packed start. This protein powder is exceptionally ‘clean’ compared to most other available protein powders – no added sugar or artificial sweeteners and it’s sourced from German cows in the countryside.